by Newt Gingrich: The most startling revelation from fired FBI Director James Comey’s testimony this week was his barefaced admission that he intentionally leaked details of his private conversations with the President to the press in an effort to prompt the appointment a special counsel. This statement is tremendously important because it completely delegitimizes Robert Mueller’s so-called independent investigation and reveals it as poisoned fruit. Think about it: Comey was the top law enforcement officer in the nation before he was fired on May 9. Had he felt a special counsel was necessary to investigate possible Russian influence in the 2016 election, he could have requested one from Congress at any time. If he felt his conversations with President Trump warranted additional attention, he could have approached Deputy Attorney General Rod Rosenstein about it. But instead he decided to do nothing. Comey apparently didn’t think there was need for a special counsel until the Monday after he was fired, according to his testimony. In a clear act of retaliation, Comey went outside the system and shared secret information with the media via a college professor-friend, in a calculated attempt to inflict pain on the Trump Administration. Further, he said he turned all his memos about his conversations over to the special counsel upon his termination – so Mueller’s investigators already had all they needed to make their own decisions. But Comey knows that the press feed off attacking Trump. He also knows that they have an incomplete, false understanding of the Russia investigation and would therefore gladly perpetuate the false narrative that Trump was somehow under investigation. He saw a chance to cause drama, and he took it. This kind of petty vindictiveness is so unbelievable, I wouldn’t even write this type of stuff in one of my novels. The truth is, Comey behaved exactly like a bitter employee who had just been fired. He said nasty things about everyone from President Trump and Attorney General Jeff Sessions to former Attorney General Loretta Lynch, who served the Obama administration. The common thread in his testimony was that his firing was everyone’s fault but his own. But there’s another wrinkle in this story: Comey and Mueller are very close. Let’s also not forget that 97 percent of campaign donations from Department of Justice employees went to Hillary Clinton in the 2016 election. The culture and people at DOJ are predisposed to be hostile to President Trump. 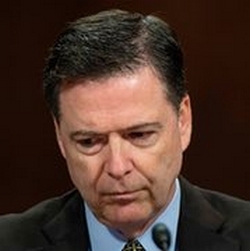 So, what we have here is a fired FBI director, who leaked private material to the press, so he could get his friend appointed as a special counsel in order to take retribution on the President – with the aid of a department full of federal lawyers who would have rather seen Hillary in the White House. And we are supposed to believe this will be an objective, unbiased investigation? Comey’s testimony – and the situation he orchestrated around it – really show the depths to which the deep state will go – working around Congress, outside of even the federal process – to damage and undermine President Trump. And it perfectly illustrates how sick the system has become. In my new book, Understanding Trump, which will be released Tuesday, I describe deep state operatives like Comey as the permanent opposition. They will stop at nothing to mar the Trump presidency in order to keep their influence. Make no mistake: This is not about law and order, it is not about justice, it is not even about any investigation. This is about influence peddling, this is about the search for vengeance, and this is about stopping the revolution President Trump was elected to implement. This is everything that sickens normal Americans about the swamp. America is on a knife’s edge. The question is now whether Republicans in Congress will have the courage to stand with President Trump and fight the deep state that was personified in Comey’s testimony Thursday. Tags: Newt Gingrich, commentary, Comey, invalidates, Special Counsel To share or post to your site, click on "Post Link". Please mention / link to the ARRA News Service and "Like" Facebook Page - Thanks! DOJ should shut down the Special Counsel because 'Comey Invalidates Special Counsel' as indicated by this article.